Ham radio`s digital era continues to expand as new modes emerge, and the good news is you don`t need to buy a lot of fancy new equipment to join the fun! All it takes is your existing radio, a computer, some free downloadable software, and a soundcard-equipped USB interface like the MFJ-1204 to get started. 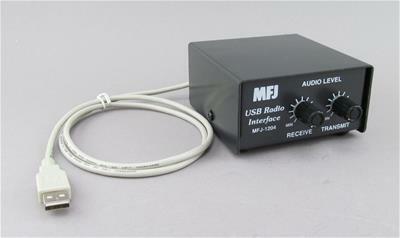 The MFJ -1204 stands out because it is faster to set up and easier to use than any other USB-interface on the market. Initial no-solder jumpers take only a second to install, and once in place, they`re locked in until you decide to change radios. To hook up, simply connect the MFJ-1204 to any free USB port on your computer and plug the appropriate interface cable into the back of your radio. That`s it! No need to disconnect the microphone or fumble around with multiple patch cords to get started. Convenient front-panel controls set Receive and Transmit levels, and there`s no front-panel “Delay” to adjust because the MFJ-1204 controls your radio`s PTT line using a unique internal detector circuit. In addition to the MFJ -1204 interface, MFJ offers a complete line of patch cables to fit all radios equipped with rear-panel Data and Accessory jacks. Just select the one configured for your radio, plug it in, and go. The signal path between the radio and computer is completely isolated against ground loops and common-mode noise. Whether you`re thinking about exploring digital operation for the first time or a seasoned veteran, you`ll find the compact MFJ -1204 exceptionally user-friendly and simple to use. Sometimes the best things really do come in small boxes!